We personally are available 24 hours a day, 7 days a weeks to answer your questions and fulfill your needs. Our goal at Brown's Cremation & Funeral Service is to provide you with all the options that are available at a price you can afford. You may find peace in knowing that when we bring your loved one into our care, they will remain in our on-site cooling facility until final disposition. Whether you choose an elaborate ceremony or no service at all, we are here to serve you in the way that is best for you and your family. 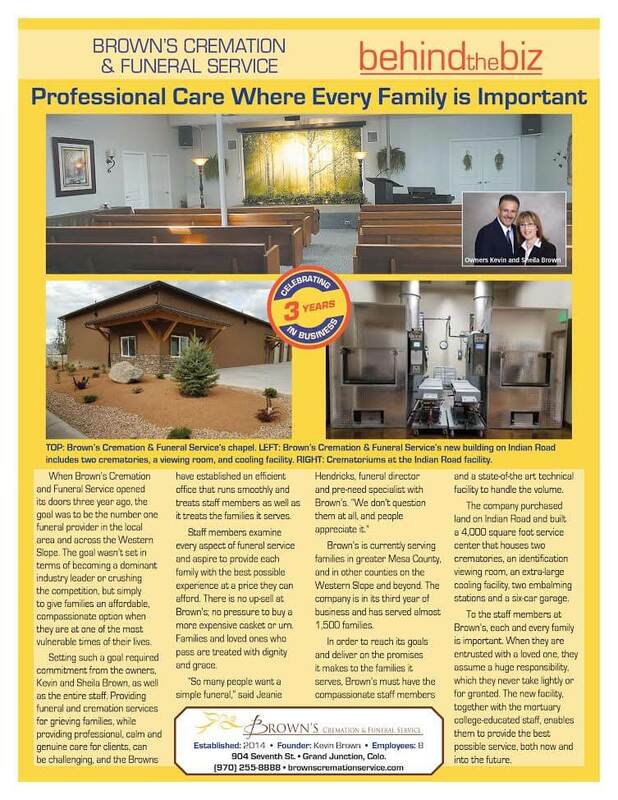 Brown's Cremation & Funeral Service Inc. prides itself in providing superior service. Our professional staff is available to coordinate and direct a funeral or memorial service at our funeral home, cemetery, church or other facility. In dignity and respect in the care of the deceased, as we compassionately care for the living who survive them as we explore ways to memorialize the life of their loved one. That memorialization options be presented to all families that choose cremation, as well as to those who choose burial. And that those who have passed away should be memorialized in a way that is meaningful to the survivors challenging us to find the method that meets the unique requirements of each family that we serve. We think this Code of Ethics will help you and your family during your time of loss. As a family-owned operation serving Grand Junction and the surrounding areas, we thank you for entrusting us with your loved one and are committed to bringing a high level of care and compassion to our work.